Media: 160 pages in A5 format with card cover, 50 pages of colour photos, 30 pages of colour artwork, many illustrations from the aircraft manuals, 1/72 scale plans of all versions plus war-time photos in black and white. Advantages: Very informative, easy read plus “walk rounds” of all surviving aircraft. 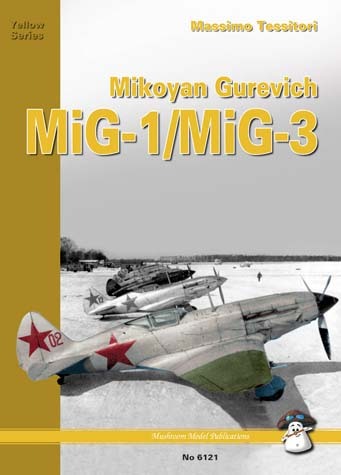 The Mikoyan Gurevich bureau, MiG, is probably the best known of all the Soviet aircraft manufacturers. This newest book from Mushroom Model Publications details the development and fighting history of the first of that bureau's fighter aircraft, the MiG-1, and the MiG-3 that was developed from it. The first eight chapters covers the development from the K-project through the I-200, MiG-1, MiG-3 and later developments like the I-230 and I-231. Also among these chapters, are numerous photos of the aircraft plus 1/72nd scale plans. This is followed by four chapters covering the wartime history from Operation Barbarossa through summer and autumn 1941, winter 41/42 and after the spring of 1943. Again there are many photos from this period. We then get into the colour profiles which include a massive 102 colour artworks showing the standard and non-standard schemes from various periods, summer and winter plus several profiles of aircraft captured by the enemy and put into use. Next come detail photos with sub-sections covering engine, armament, canopy, cockpit, fuselage, tail, wing and undercarriage. Most are colour shots of restored aircraft with some black and white period photos plus line drawings to illustrate the subjects. Last but not least, there are three pages of text and photos of all the preserved aircraft known to exist. I have by now reviewed quite a few of these Mushroom books and every new title seems to be better than the one before. I just wonder how much better they can get, and really look forward to seeing what interesting subjects they will come up with next. Highly Recommended to all modellers and historians alike.